Following on from Part One, I finally got round to playing with this a bit more; however I still have not had any luck with running Mac OS X Lion on my Intel Core 2 Duo 2.0 GHz Mid 2007 Mac (an A1283) with only 1 Gig of Ram 🙁 however I have bought 2 Gigs from Crucial with a view to using Lofn as my Fulla replacement, and using her as my main server for Just Vigilantes. 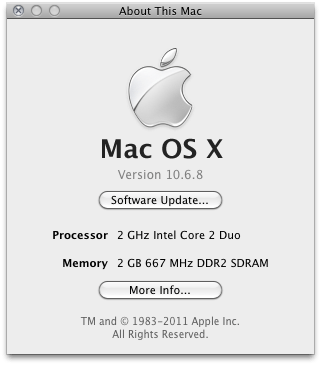 So my mac mini now has 2 Gigs of Ram meaning that installing lion is easy now. there are a couple of hard drive mounts for making use of the optical drive bay available [1 2] so the next addition may be a second internal hard drive; or an upgrade of the primary hard drive. Previous post It comes in pints?